“Vapers and Smokers Unite” is a letter writing campaign designed to promote awareness concerning electronic cigarettes. Due to misinformation and ignorance about e-cigs, there have been some unrealistic and unfair regulations being proposed regarding electronic cigarettes. Sensationalist media has made wild claims about e-cigs being more hazardous than smoking, and politicians from many countries have begun to pass legislation restricting e-cigs even though they hardly know anything about the subject. This campaign aims to combat this problem by asking vapers and smokers alike to voice their concerns to their government representatives. The lack of information is staggering, as many people are totally ignorant of the fact that electronic cigarettes present a real alternative to smoking and a viable cessation aid. It is time for all governments around the world to be given a nudge in the right direction. These governments should not make rash decisions based on biased and unfounded so-called “evidence,” and instead should investigate the truth, and make that truth known to the public. “Vapers and Smokers Unite” is asking everyone to write two letters to send to the Minister of Health (or your country’s equivalent) and your local representative. In this letter, simply share your story of how vaping has changed your life or the life of someone you know. Ask for independent studies to be undertaken and for all information from those studies to be made public. Everyone should have the information to make their own informed choice about vaping. 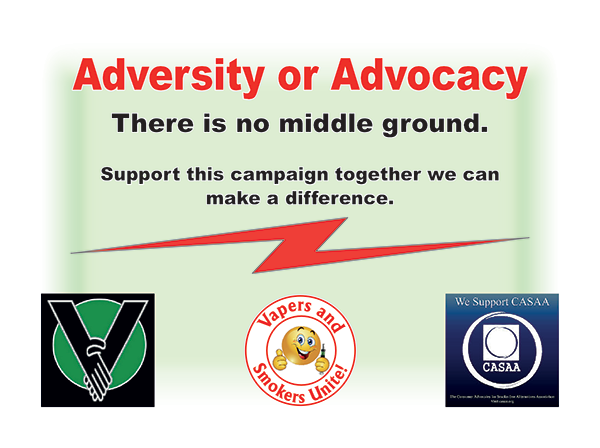 Visit http://vapers-and-smokers-unite.co.uk/index.html for more information. This entry was posted in Vapeology and tagged campaign, electronic cigarettes, smokers, unite, vapers. Bookmark the permalink.